Astronomy is an exciting hobby! It ignites our curiosity of the fascinating universe around us. Unfortunately buying your first telescope can be an extremely complicated task. You can easily find yourself lost in technical jargon and endless options available. Beginner shoppers often jump into buying an unsuitable telescope, get frustrated trying to use it and eventually even give up on pursuing astronomy altogether. The following guide explains everything you need to know before buying your first telescope. We’ve also short-listed our Top 2 Telescopes for beginners, enthusiasts and amateur astronomers. The #1 feature of any telescope is: Aperture. Aperture is the diameter of the telescope’s main optical component (consisting of either a lens or mirror). The larger the aperture is the more light comes in the telescope and the brighter your image will be. A telescope’s function is to simply enhance the light of the moon, stars and galaxies thus allowing us to see them in the dark. With a large aperture you will be able to see more stars and see them more clearly. When we look at the stars with our naked eye we can only see the brightest ones. This is because our pupil acts as a very small “lens” and can only gather very little light. A Refractor telescope is what most people think of when imagining how a telescope looks like. It is a long, gleaming tube with a large lens at one end and an eyepiece at the other. This is the most common type of telescope. A Refractor telescope can provide the finest images attainable for a given aperture. A Reflector telescope uses mirrors instead of lenses. Because mirrors are cheaper to make than lenses, it is a better option when considering price vs. aperture. When well made a reflector can provide sharp, high contrast images at a small fraction of the cost of an equal-aperture refractor. A Reflector will also be much smaller in length than a Refractor of the same aperture. An all-time favourite telescope for amateur astronomy. The Meade Infinity 70mm Telescope is a relatively simple Refractor telescope but proves to produce an excellent view of the moon and stars every time. 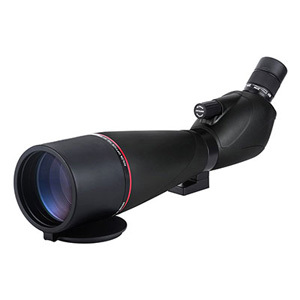 This telescope by Meade is one of our best sellers because of its ease of use, good optical quality and affordable price. The Meade Infinity 70mm Refractor Telescope comes with its own tripod as well as all the necessary add-ons to get you started right away (Easy operating instructions, red dot view finder, additional eye-pieces etc.). Overall this model is great value for money and a perfect choice if you are looking to buy your first telescope or a gift to someone. Suitable for all ages! A magnificent choice for those lucky enough to have the perfect viewing point at home. Why settle for only star gazing when you can enjoy enhanced ocean or landscape views as well? The Avalon 80mm Spotting Scope kills two birds with one stone. Its generous 80 mm aperture will allow you to clearly see the moon, planets within our solar system or even the rings of Saturn. But unlike other astronomy telescopes, it is also designed for viewing landscapes, ocean, beach or wildlife. Also included with the Avalon 80mm Venture HD Spotting Scope is a table-top tripod and a carry case. When I use binoculars or a powerful camera lens I get motion sickness. Is there a way to prevent my getting giddy and uncomfortable? I plan to get something for my wife to look at the moon and stars. We are on a 5-acre block in Perth and there is no surrounding lights bear our house. It is likely that you are getting the motion sickness due to the image being unstable. This is quote a common issue. To avoid this you can either use lower power binoculars, use a very stable tripod or both. for basic moon and stars watching it is good to start off with binoculars. They are easier to use to find and observe the moon and near planets than telescopes. We have a good guide on choosing binoculars for astronomy below: https://procular.com.au/choosing-astronomy-and-night-binoculars-the-complete-guide/ — the first two models recommended in this guide would work well in your case and shouldn’t cause motion sickness while viewing. I have a 20_60 x80 spotting scope at the moment,and are lately having difficulty picking up yacht sail numbers. Will a 6_ 100×100 make a huge difference? Many if not most of the spotting scopes on the market today are 20-60x. i.e. 20x to 60x magnification. The ones that claim to have much higher magnifications, such as 6-100x in this case, normally have an average to even poor image quality which only gets worst as you increase the zoom. If an image is not clear enough to show a sail number at 30x or 40x then at 100x it won’t be clearer unfortunately. If your view does already show the yacht’s number but is just not sharp enough, then your best bet is using sharper/better optics. This means a 20-60 spotting scope but with higher-end lenses. Overall this means spending more money to choose a higher-end model of 20-60×80. 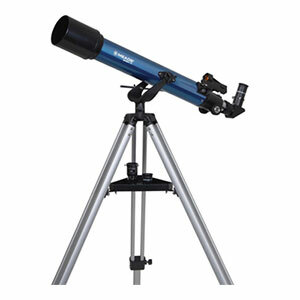 As a good entry level telescope for your 5 years old son we can recommend the Bresser 60/700 telescope below: https://procular.com.au/bresser-junior-60700mm-bluegrey-refractor-telescope/ It is very easy to use and with the included tripod he should be able to see the moon and near planets on a clear night. It is also easy to transport and setup quickly if you need to travel to a darker area for viewing. Thanks for your suggestion Adam. Much appeciated. I’m hoping to buy a good quality telescope and it would be awesome if, on the right night, I could see saturn’s rings. I might have to take it to a better spot than my home as the many trees in my area limit my view, so it would have to be portable. I would not want to spend a fortune on it but I don’t want to spend hundreds on a telescope that I cannot at least get a good view of the planets. I like the sound of the dobsonian telescopes but am concerned that they need batteries? Did I read that correctly? They need batteries in the base I believe but not sure what they power. In any case, I would love to hear your suggestions. We live on acreage and would like binoculars to see down the valley. Could you please let me know what type would be the best, I would like it on a tripod so we can leave it on our patio. Thankyou. Is there any product that can make me view 30 and 50 KM in distance? I need to pair to long range antennas and the manual says to use a binocular/scope to see the other side of the installation so you can point antennas correctly. My dad wants a scope that will look at both stars and land/sea? Its mainly for the stars but his place has a great view so he will want to be able to look at the beach as well? Im getting this for his bday but I’m having trouble finding one that does both and don’t want to have to buy a telescope and a spotting scope? Any ideas? I”m after a sea watching telescope for my husband. he does not want to see the stars or planets, and no he doesn’t want binoculars. we live by the water and he wants one to watch the ships sail past. Can you recommend any for me please. Im new to all this and its a bit over whelming. Is view through a telescope possible if eye glasses are necessary? is there any eye relief? Most people who require eye-glasses can easily use Telescopes. The telescope itself already magnifies and enhances the view so there is no need to use the glasses. You might need to quickly adjust the telescope to your specific eye-sight but once set you will not need to re-adjust. Regarding eye-relief, with binoculars there are quite a few models with long eye-relief that can be used with glasses on. Unfortunately telescopes have much stronger magnifications and therefore much shorter eye-relieves. So using them with the glasses on is rarely possible.